The remains of the building at the present time comprise the west tower, and part of the east wall of the nave with the chancel arch and an adjoining fragment of the north wall of the chancel. All other areas of the fabric have been demolished. 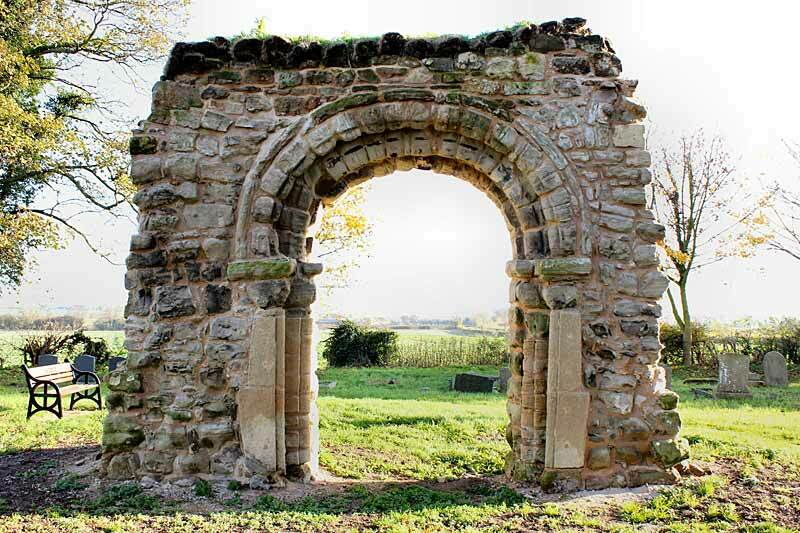 The visible remains comprise a 12th century chancel arch set into a contemporary wall with the western return of a lost chancel window, probably 14th or 15th century in the north wall. The tower is of two stages. The tower arch is of the 14th century, whilst the remainder of the tower including spiral stair and remains of a crenellated parapet date from the 15th century. 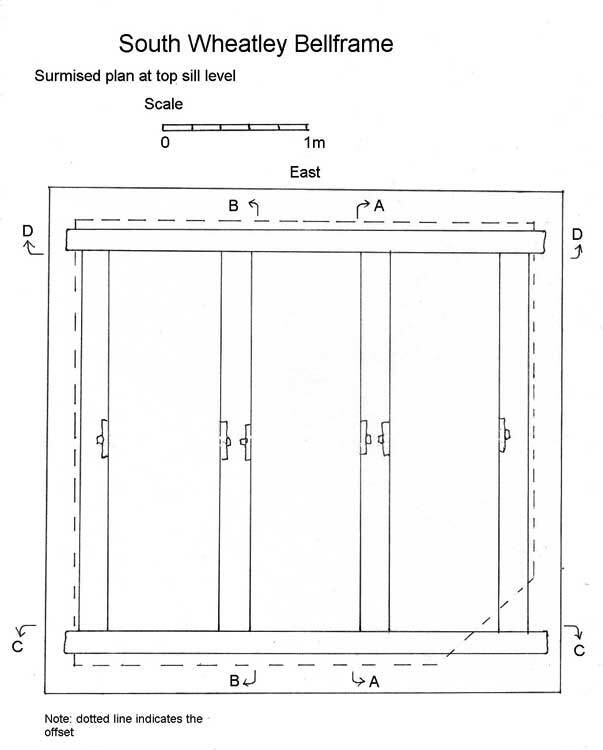 The east wall of the tower contains a weather mould for the former nave roof which appears to be of shallow pitch, as described by Glynne in 1869. A timber bellframe has survived largely intact at belfry level. The frame is an Elphick 'V' type, Pickford Group 6.B. It was dated by dendrochronology in 2013 which revealed a probable construction date in the period 1666-70. The frame is in very poor condition after being exposed to the elements for most of the last 100 years. 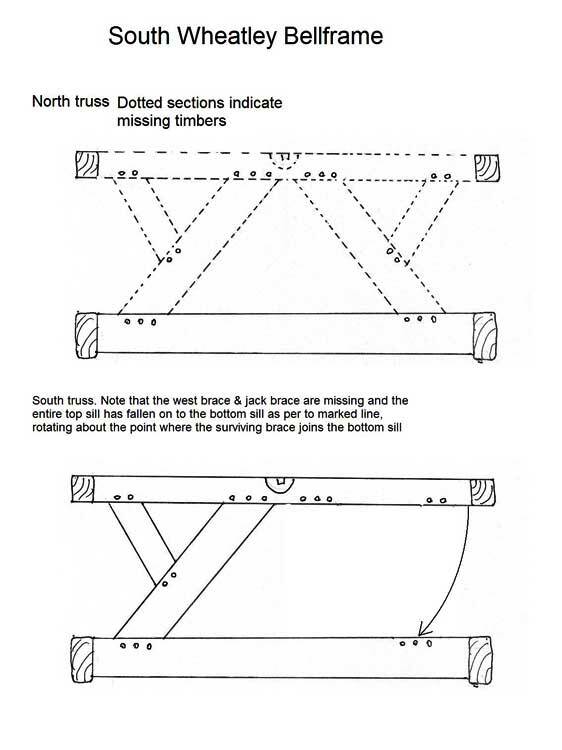 The north truss is missing apart from the bottom sill and the south truss has collapsed into the rest of the frame. The base timbers are very delicate and it is somewhat of a miracle that it did not collapse before repairs were undertaken. All timberwork is heavily eroded and friable. 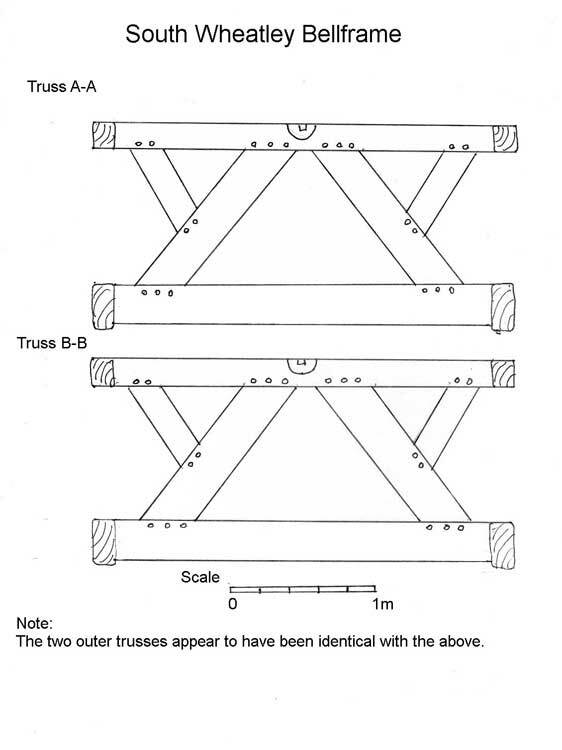 It was drawn in 2014 by George Dawson but owing to its condition it has only been possible to accurately measure the two central trusses and the west frame end; however it is clear that the frame was ‘of a piece’ and all trusses are very similar to each other, as are the two frame ends. Glynne's 19th century description indicates that fabric of the 12th, 13th, 14th, and 15th centuries was all apparent at the time of his visit. Substantial archaeological remains of the former nave, aisle, porch, and chancel are expected to survive below ground. Portions of the fabric are expected to be buried on site whilst much other material has been reused around the village of South Wheatley and probably the adjoining village of North Wheatley. Main No surviving roof. No surviving roof. 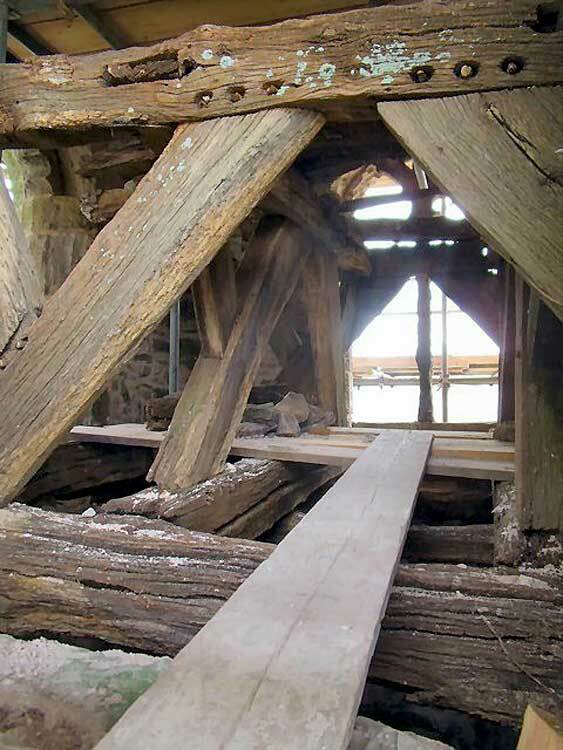 Tower roof does not survive but bellframe and support timbers below date to 1666-70. 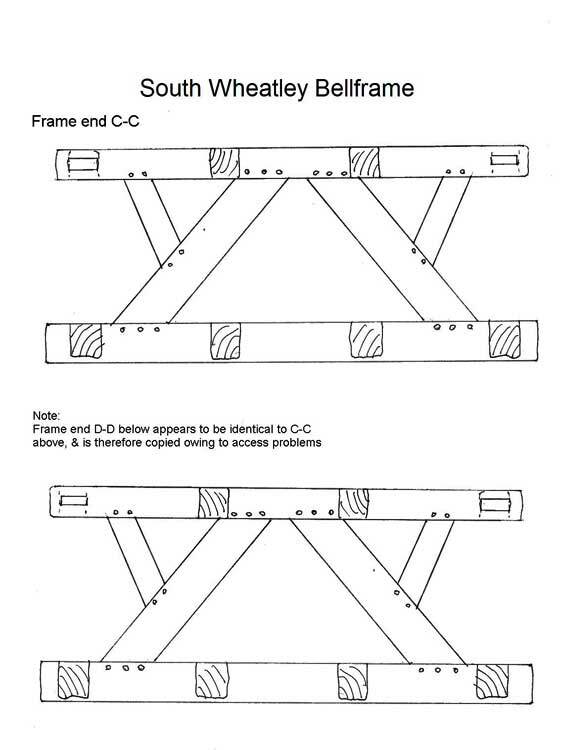 Vestigial roof timbers noted in 2011 but fragmentary and in state of collapse. Wooden frame, Elphick 'V' type, Pickford Group 6.B. Dated by dendrochronology in 2013 revealing a probable construction date in the period 1666-70. Scheduled for preservation Grade 2. Plaster covering & date Open stonework on remaining walls Open stonework on remaining walls Open stonework. No major archaeological excavations are known to have been undertaken but in 2013 archaeological recording was undertaken by Ryedale Archaeological Services Ltd on the works of conservation. Loose stonework and the tower structure were recorded at this time. The report may be downloaded here. The fabric has clear dating from the C12th to the C15th with documentary evidence supporting the intervening periods. The building now comprises only the west tower, chancel arch, and a fragment of the north chancel wall. Restoration and repair took place in 2013 when the vegetation was cleared, repointing took place throughout, the tower re-roofed, and the bellframe stabilized and a steel cage introduced. The churchyard is rectangular with the church offset to the north. There are burials on all sides, but especially to the south and modern burials at the extreme south end. The field to the east contains the site of the deserted/shrunken medieval village of South Wheatley. The overall potential for the survival of below-ground archaeology in the churchyard is considered to be MODERATE-HIGH, comprising mainly burials of all periods, landscaping, and evidence of demolition in the C19th. Evidence to the east side of the churchyeard may assist interpretation of the adjacent DMV/SMV. Below the former floors of the nave, north aisle, and chancel it is considered to be HIGH, subject to an unknown degree of weathering, below the intact tower it is HIGH-VERY HIGH. 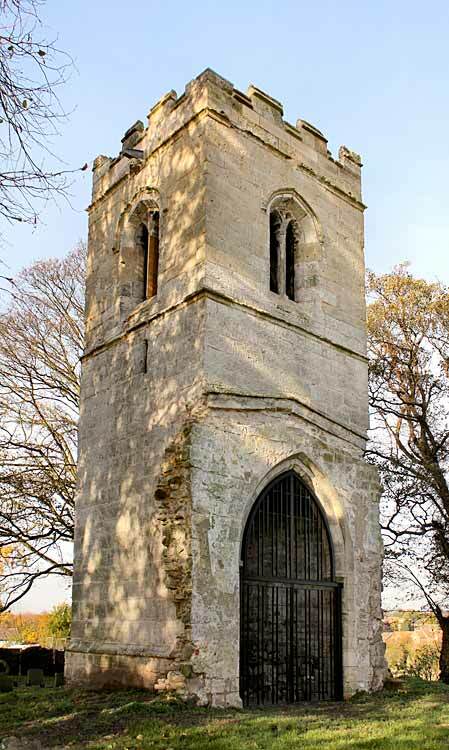 What remains of the standing fabric of the church is wholly medieval and the potential for surviving medieval archaeology in the standing fabric of the chancel arch, stub wall of the chancel, and west tower is considered to be HIGH-VERY HIGH. Exterior: Burial numbers expected to be average. Evidence of the C19th demolition works should be present. Interior: Stratigraphy under the site of the nave and chancel, and the intact tower, is likely to be medieval, with later layers and major C19th demolition disturbance. In the site of the body of the church the stratigraphy may be punctuated by medieval and perhaps post-medieval burials. The survival of stratigraphy, having been open to weathering since the late C19th, is unknown.